Like many post-industrial towns, Milwaukee, Wisconsin is a community in flux. The city went from 75 foreclosed homes in 2007 to over 1200 foreclosed homes and 2700 vacant lots in 2013. With all of that vacant space, the city is now looking to urban agriculture as a chance to start afresh. Tim McCollow runs the Milwaukee Office of Environmental Sustainability’s HOME GR/OWN program, a city-led economic development program centered on urban agriculture. HOME GR/OWN is a threefold initiative that turns unused space into community assets while stimulating the local economy and increasing access to healthy food. Like many urban areas, downtown Milwaukee is considered a food desert, with little affordable access to sustainable, healthy food. By introducing community gardens, urban farms, healthy food stands and green space, McCollow hopes that land ownership as well as local entrepreneurialism will increase in the city. 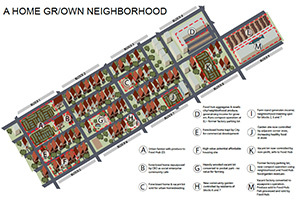 The Lindsey Heights area will act as the pilot neighborhood for the program. By collaborating with community partners such as Alice’s Garden, a community garden offering CSA shares and Walnut Way, a local conservation group that is buying abandoned properties and creating urban farm projects, McCollow hopes to build on established momentum. The idea is to give those displaced by the loss of manufacturing a new direction for their communities. “There are 100,000 people in Milwaukee central city.” explains McCollow. “If we can pluck out and really engage five out of 100 people, that’s an overwhelming number for us.” HOME GR/OWN is still new to the inner city, only beginning in earnest this past July. Initial efforts look promising, according to McCollow. Originally, the city expected the HOME GR/OWN Program to be funded by the Bloomberg Challenge, but despite making it to the finals, Milwaukee missed out on a monetary award. The city will fund the project with city funds while seeking additional sources of capital. By expanding current zoning laws, removing or reducing restrictions on inner city agriculture and aiding locals who want to begin a sustainable business, Milwaukee hopes to enable its residents to embrace the program.